A favorite of all ages, these delicious pops are made by dipping a slab of salt water taffy in our delicious chocolate. They are a sweet, chewy delight! Molasses, Vanilla and Chocolate Taffy Pops are dipped in Dark Chocolate. 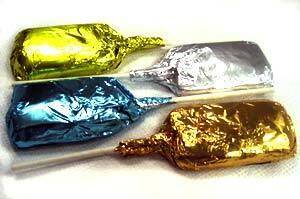 Caramel Taffy Pops are dipped in Milk Chocolate.